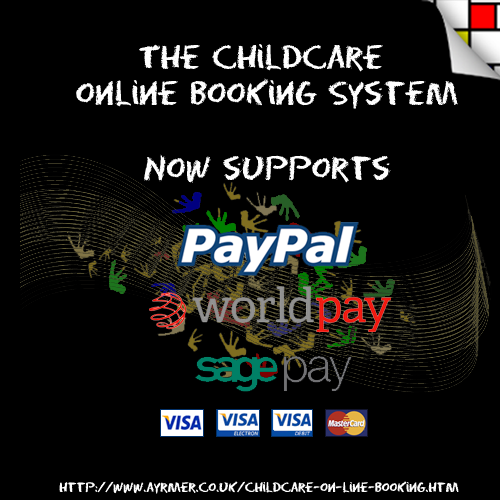 The Childcare on-line Booking product allows the administrative users to create any type of payment method with associated rules. These compliment the standard payment types that can be activated. The standard payment types already have set behaviour and functionality on the system. However the user also has the ability to control how these work (see options against Custom Payment Types below). Sage Pay (Payment Service Provider) - This inbuilt integration can be added to your account so that you can receive secure credit and debit card payments. This needs to be set-up in conjunction with an Internet Merchant Account that your bank can provide. The Sage Pay Payment Gateway contains a variety of options including customisable fraud rules, monthly reports and 3d secure settings World Pay (Payment Gateway) - This inbuilt integration can be added to your account as an alternative to Sage Pay so that you can receive secure credit and debit card payments. We have found that obtaining a WorldPay account is generally easier than Sage Pay, especially if you do not have an Internet Merchant Account. Childcare Vouchers - The system can record payment via childcare vouchers. At the time of booking the parent specifies the Voucher Provider and the Reference to the voucher being used. This is then shown in various reports to allow you ensure you have received the vouchers and mark the booking as paid. The system features various reminders to the parent about outstanding vouchers, as well as automated e-mails when the voucher is marked as received. Credit System - Parents can maintain a credit on their account. Credits are assigned by administrators or by purchasing credit directly. Credits can be used to fully or partially pay for a session. Using these options you can setup a cash payment type as you like. However what happens if you only want one type of club to take this method? What happens if one parent is abusing the payment method? This can be handled easily as you can mark both sessions and parents with what payment methods you are happy to accept. By default all payment types will appear (subject to above rules) but you exclude certain types and the changes impact the system immediately. This applies to both standard and custom payment methods.